Editor’s Note: This post is written by Dave Schappell, Founder and CEO of TeachStreet. In it, he talks about his company’s transition from a free to a paid service, and shares five tips that may help other startups make the leap as well. Over the course of the last two-plus years, I’ve worked with a team that has lived the web service transition from free to paid, as TeachStreet has evolved from a place to find local classes in Seattle, to a global supplier of online and local classes (I’ve included a high-level timeline of our full 2-year transition, at the bottom of this post). The discussions around freemium and the like are numerous — I won’t bore you with additional words on those topics. 1) Give your customers plenty of notice, and give them a (real) chance to comment/contribute feedback. The response from customers also told us that we had been doing a very poor job of communicating our value to them. Many said that we’d never delivered customers, but when we looked at their teacher dashboards, we saw large volumes of visitors, and leads delivered. We realized that we had forgot to set up and communicate that value with a regular metrics mail! Thus, we prioritized building and delivering that communication before we turned on fees. Several teachers also asked why they couldn’t ‘earn listings’ by doing things other than paying money. We thought that was a wonderful idea, and built a way to do just that (see #3 below). A recent example where a fee increase was initially handled poorly was at ZenDesk. Initially, their announcement led to a huge customer backlash; happily, they made changes to the pricing proposal that grandfather’d in existing customers. As a long-time ZenDesk customer, I’m glad they listened and made changes, but I’d bet they could have handled this better with some more open customer discussions. An example where I think this was handled very poorly was when Ning changed their fees — it seems like they just threw many customers out to the curb, with no input, and no negotiation. The price obviously needs to work for your income statement as you look out 6-12 months. But, it really needs to work for your customers. If the alternatives are much more attractive, expect to see customers flee. In our case, we priced new listings at $3 — those listings last 30 days, or until we deliver 10 customer leads (whichever comes first). Many in the lead-gen industry scoff at this $0.30/lead pricing, but we had to look at free alternatives such as Craigslist and Twitter. Ultimately, we know that we’re a lot more than just a listing tool — we deliver strong SEO benefits, reviews/ratings, payments, UGC tools and more. And, all for less than a cup of (Seattle) coffee. If we can’t make that pricing work, then we’ll just have to deal with the ramifications. It seems fair. Will we have to raise prices in the future, or adjust the # of leads? Of course, that’s a possibility. But, we don’t expect to do so in the next year. We’ll continue to review the service/benefits, and we’ll do our best to be transparent with our customers. Money is one of many forms of compensation. In our business, high quality content (articles, Q&A, etc) are equally or more valuable, as they help search engines to find our site, and in turn, help people discover great classes/courses, and teachers/schools. We ended up creating a virtual currency model where a teacher earns a ‘point’ for each article written, or question answered. And five points can be redeemed for a free class listing. A teacher can quickly find five questions to answer, and thus earn a free listing in less than 10 minutes. Within a week of launching our virtual currency, 9% of all our listings that week were paid for with points. This helps us (great keyword-rich content for search engines), but also helps the teacher, as we automatically merchandise their class listings around any articles and answers that they provide. And active teachers have their classes show more highly in search results. We see this as truly a win-win, and we don’t miss the $3 at all! Many businesses could do a better job with this. I like how Flickr handles it, as I’ve fluctuated often between a Basic and Pro Flickr member. I know that I’ll always return as a Pro, but there are times when it’s less necessary. Thank you to Flickr for making it so easy. I wish Netflix would do a better job of this, giving me continued access to my movie wish list, and recommendations, as I frequently transition from paying to non-paying customer, as my free time fluctuates. But, they lock me out of my movie list when I’m not paying — why? If you have a free service, this one is quite difficult, because there are bills that need to be paid. But, if you’re a service that has decided that you need to raise prices, you should seriously consider locking in the old pricing for your existing customers. Or, gradually increase prices. Or, provide them with a generous allotment of credits (you get the idea). In our case, we created a promotion, offering 6 months of Pro Member benefits for $10 per month (compared to $29.99/month). The weeks prior to this promotion our Pro Member subscribtions were relatively flat; two week after running the promotion our subscriber base increased by 152%. We were psyched to see the level of redemptions on this offer, and hope that we can continue to earn their trust/business over the next 6 months. If we don’t, we didn’t deserve it to begin with. 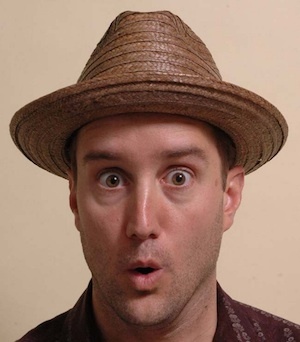 SEOMoz is probably the best source of SEO advice/tools on the internet. They used to be free, but have gradually introduced monthly/annual memberships. The current cost is $799/year (I think), but when I joined in 2006, it was $299/year. What’s cool is that they still honor the $299/year fee. At that price, I’ll never go away — and, I continue to rave about them to my friends! And, while I know it’s a steal at $799, I still may balk at it, because I know what I paid once upon a time. Great job, SEOMoz, for thanking those who helped you get where you are today. Airlines do a TERRIBLE job of this — how many of us have been lied to by airlines with their frequent flyer programs? They tell us 20k miles will get us a free flight. Then they limit the seats. Then they have offers for 40k and 60k miles. Then they shut down the programs entirely. I’m OK if they change the rules going forward, but to change the rules for the miles that I earned under their earlier offer is just wrong. 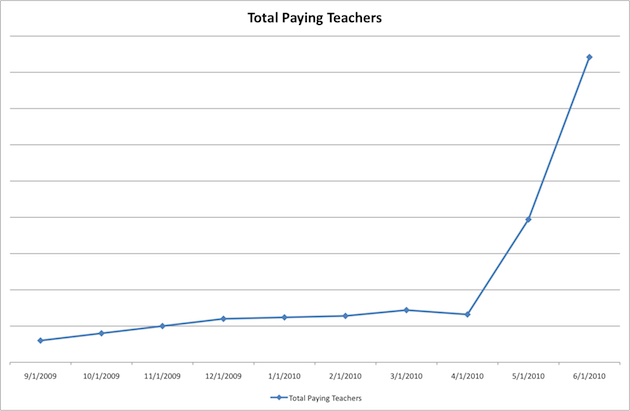 In our case, we decided that teachers should only have to pay to re-list a class if we’ve delivered a lead to them in the preceding 30 days. So, if a teachers lists a piano class or a photography lesson and we don’t get them a customer phone call, message, or enrollment in the next month, we simply re-list the class for free. That way, they don’t need to think about re-paying until the point where we’ve delivered value. And, we grandfather’d in our existing listings in a similar fashion. This served a double-benefit — for teachers, they’re guaranteed value (it’s another way of saying ‘thank you’ for being early supporters) and for TeachStreet, it maintained class selection, which is good for search engine traffic. In fact, we’ve grown our overall listings significantly since before the change in fees. Other businesses will have their own unique characteristics — you could slowly implement fee increases for existing customers (as discussed above), provide transition pricing, or convert past-activity into benefit/tier levels, to name a few. But, you get the idea. Moving from a free service to a paid service without scaring off customers can be done. 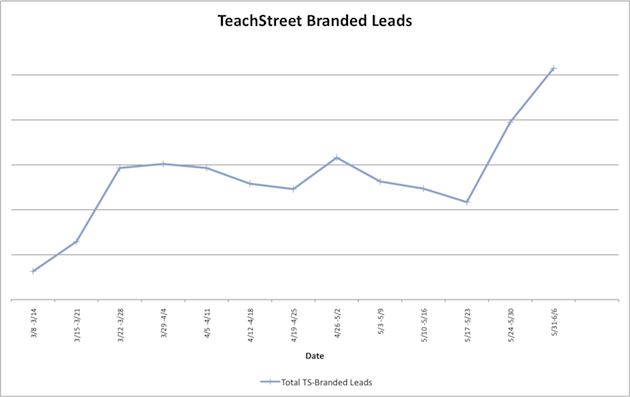 With better quality data on TeachStreet we have been able to increase the number of leads to teachers by 25%, students are receiving faster responses from active teachers, and our operational revenue has doubled since launching our paid service. In closing, remember that making the free-to-paid transition gracefully is just good business. Not only are these your longest-time customers, who have helped you in myriad ways (feedback, patience, content, etc.) but the impact of making this transition poorly can be disastrous and/or long-lasting, with negative PR, ruined relationships, and unpleasant employee morale issues. I hope the list above is helpful — and, I’m sure that I missed some things. Please contribute ideas in the comments. June 6, 2010 (at present) — Traffic’s been growing, Revenue has ramped sharply, and we’re 100% sure that we’re going to have to keep pivoting. Because that’s what startups do.